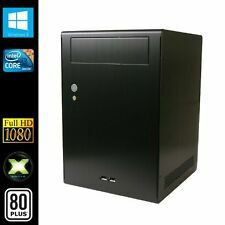 Lenovo k450e Desktop Computer 8G Ram/1TB HD w/20"Monitor, Keyboard, & More!! Comes with the tower, monitor, keyboard, mouse, and all power cords. Computer is in excellent working condition. Does need to be updated to Windows 10 though. Hard Drive Size 1TB. RAM: 8Gb DDR3-1600. Processor Type Core i3. RAM Size 8 GB. Graphics RAM Type DDR3 SDRAM. DVD /-RW Writer Dual Layer. Its low power consumption and 1080p Full HD technology make this Mini-PC really versatile. Sleek space-saver: Streamline your space with a desktop that’s easy on the eyes. Wireless Connectivity Dell Wireless-N 1705 802.11bgn, 1x1, 2.4GHz Bluetooth 4.0. Audio Integrated 5.1 Audio with with Waves MaxxAudio.